With having so many different musical outlets already, why did you form High Spirits? What were your goals with the band? And how do you think you have grown with your songwriting since the demos? I had no goals whatsoever for High Spirits. In 2009 I spontaneously wrote a song called “Torture” and everything has followed quite naturally from there. I think my songwriting has grown immensely since then. High Spirits is (among other things) a lesson in taking risks. I felt quite empowered during 2010 especially. I wouldn’t have had the focus to write “Running Home”, “The Year of the Blizzard”, or even “Addicts” without having spent 2009 exploring new territory recording the High Spirits demos. 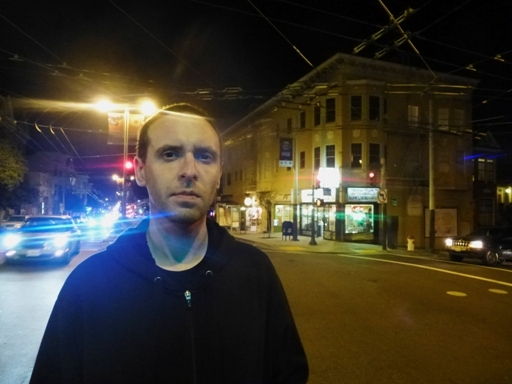 Your New Album, You Are Here is getting ready to hit the streets any day now. It is an infectious ride through some of the catchiest melodies and riffs I have heard well, since your last album. Anyways, can you tell me a bit about it? How do you think it shows growth for High Spirits? Actually it doesn’t hit the streets for approximately another month. You’re one of the first people to hear it! And your feedback is very encouraging. This album was tough, to be honest. It really took everything I had to get it finished. I’m not sure I could say what growth might be evident in the songs, but I was definitely inspired by all of the live shows we’ve done since the debut! You have been doing some serious shows with High Spirits in the recent past such as Keep It Truefestival, the Alehorn Of Power festival, and Speed Fest. How was it playing with legends like Manilla Road, and how is it different for you with High Spirits versus Superchrist or Danwbringer? How do you think your live performance has developed since the early days of High Spirits? Not just myself but all of the other guys had played in bands a lot before High Spirits, so it was easy to come together and focus on this material and giving it a fitting live show. Luckily we had the desire and opportunity to do some low-key touring in 2010 and 2011, which all happened before “Another Night”. So when that album came out, we had the advantage of all of that experience as well. That said, I think we are still reaching our peak in terms of the live performance. Sometimes it feels like the inspiration is building with every single show. (Question by Fenriz of Darkthrone) A lot of people, including my wife, just LOVE your songs, but why do you keep soldiering on with that drum machine? Are you afraid that a real drummer might get "too in the way?" The demos and “Let’s Rock” 7” have a drum machine, but the albums are real drums all the way. 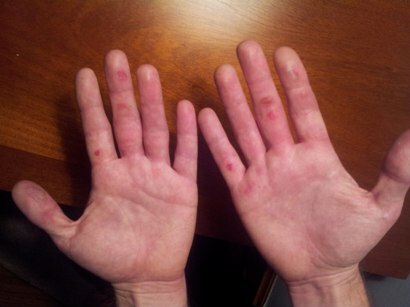 Here is a pic of my hands after the second day of drum tracking for “You Are Here”. I don’t play very often, so I don’t have any calluses. Very strange that you are not the first drummer to wonder about this! The drummer of an excellent and well-known heavy metal band once offered his services to High Spirits. I was blown away by the offer, and also to hear that it was because he thought the drums on “Another Night” were a drum machine! I no longer have the blisters from that session but I do have the drumsticks. You are involved in a ton of different bands, chiefly among them, Dawnbringer, Superchrist, Pharaoh, and High Spirits. I was wondering, with all these different bands, which one to you is the most personal? Why? And how do you feel each one represents a different aspect of your creative impulses? Or a different way, which aspect of your creative impulses does each represent? That’s a hard question to answer, because for me those are all part of the same thing, part of the same process and same effort. 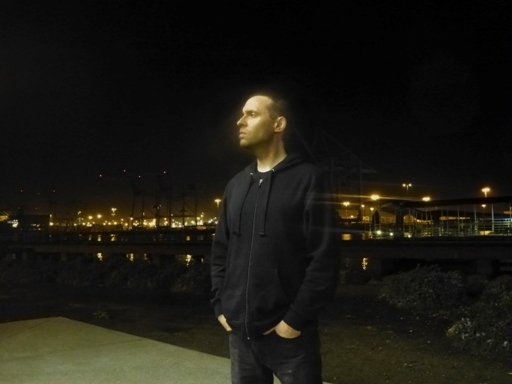 I am constantly inspired to write music and create different environments and structures for doing so. You seem to have a Minimalist approach to High Spirits. Early on, very understated packaging on the demos, 7"s, the 2013 EP, the first LP and so forth. So why are you keeping the presentation for High Spirits so low-key? Is it to let the music do the talking? Or some other reason? That’s exactly it. The goal has always been for the songs do the work of creating our image. I am mostly satisfied with the results! Our first two years were really special because we were still inside that bubble. Our entire image was a logo and a dozen songs. We’ve introduced the city skyline and now subway imagery since then of course, and our profile has increased overall, but we still keep it as simple as possible as that seems to work. As a denizen of Chicago, I wanted to get your take on the Chicago metal scene. There are so many insanely great bands that came out of Chicago (Devastation, Usurper, Sindrome, Master, etc.). What bands were the most important to establishing and developing the Chicago scene? I know it's still going on, but what do you think is Chicago's legacy when it comes to metal? I have only lived here since the year 2000, but I will tell you this: Chicago’s legacy in metal is probably the fans. There is a real dedication and goodwill amongst the metal community here, crossing many generations and nationalities. When it comes to the bands here, I think if we have one thing in common, I think that would be a good work ethic. Fred Phelps from the Westboro Baptist Church just died the other day. Are you, like so many people glad to see him gone? What do you think of people who spread hate, especially those that use the guise of religion to do it? Sorry, I don’t have an answer for that. I read in another interview that you thought the USA was more violent in general than Europe. So I was wondering what you thought the root cause of that might be? Do you think the USA gets a bad rap around the world for being too violent? And do you think that some of this has to do with the liberal gun laws here? Or do you think it is more ingrained in our culture? Actually, I’d be interested what you think given your military-eye view of the world! But from where I sit, I don’t think gun laws have much to do with it. Prohibition, definitely. And it may seem overly simplistic, but I think violence often results from people not having the vocabulary or critical-thinking skills to solve a problem before it escalates to a physical confrontation. And I don’t just mean in the heat of the moment, I also mean dealing with the day-to-day friction and frustration of life. In this sense I think education potentially plays a huge role in reducing violence, and that probably goes for anywhere in the world. Back to the music, what are some of your upcoming plans? I know you have a tour with High Spirits coming (which conveniently doesn't come to Kansas City). What about plans with Aktor and Metalusafer? Isn't a new Dawnbringer on the way towards the end of 2014? Yes, that’s all true. MetalUSAfer is most likely a “one and done” sort of thing. It’s cool that people were into it! Right now I am working on my vocal tracks for the Aktor album and making the final arrangements for the High Spirits east coast USA tour coming up in April. There’s a lot that goes into it as you might imagine, even when it’s only 9 shows in this case. After we return, I will spend the summer relaxing and recording two Dawnbringer albums for release later this year. 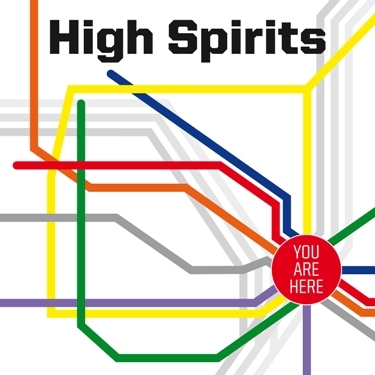 It remains to be seen exactly how much touring High Spirits might do later in the year, but it is a priority for sure. We have commitments to return to Europe in early 2015, if not sooner. I’m looking forward to all of it! Being as I have been super into High Spirits since the demo days, I am glad that we finally got a chance to do an interview, Chris! I'll leave any Final words regarding High Spirits, being Fenriz's band of the week, and so forth, to you!!! Yes sir it is great to finally give this interview now that I have somewhat gotten over my self-consciousness when it comes to talking about High Spirits. It really has been quite a ride so far for this band, and there are times when I’m not sure I can put much into words about what I have experienced. But I have learned to try. Thank you and the Nocturnal Cult entourage once again for your great support over the years!